It's a nurturing instinct isn't it, to provide good food to boost the immune system against seasonal change. My mum thought so, as did the mother of chef Raymond Blanc. The influence of his mother's cooking, based on ingredients grown in the family garden, is well documented. 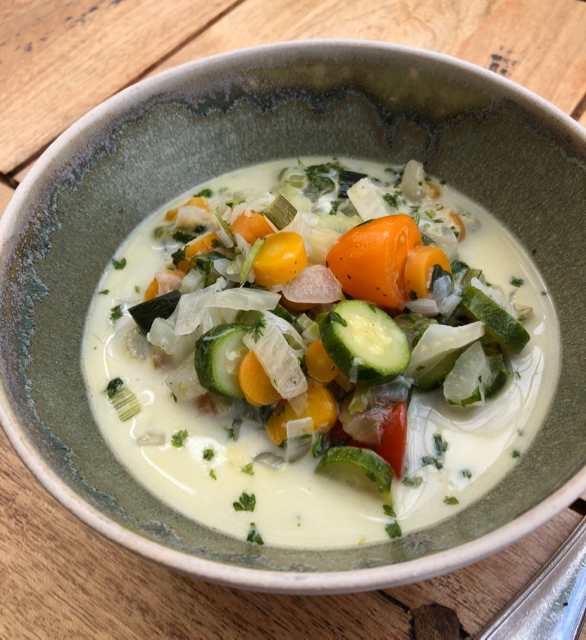 I was lucky enough to sample the soup inspired by 'Maman Blanc' when I attended a workshop at the RB Gardening School a few weeks ago. Admittedly, on that occasion it was made in a two Michelin star kitchen but it was so delicious that to say it was clean and fresh yet with complex flavours doesn't do it justice. 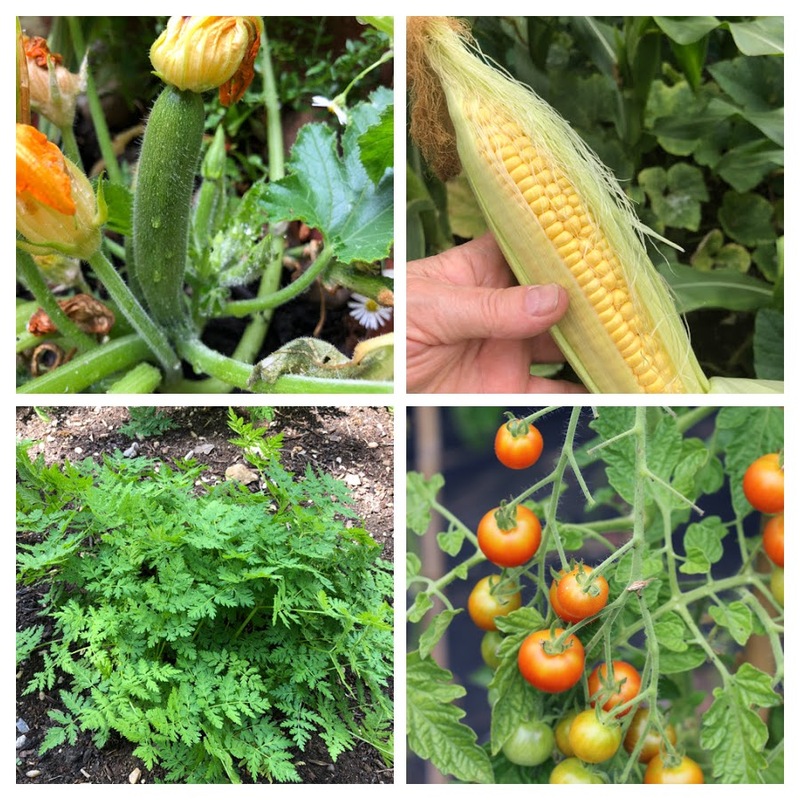 For me, it captures the connection between the garden and kitchen and proves the reason I grow fruit, veg and herbs. And this was the soup that I recreated for my son (and me, of course!). The recipe is deliberately simple, relying on good fresh ingredients, and can be easily made with whatever you have in the kitchen. And only 20 minutes to make, including chopping which has got to be good, yes? I had onions and garlic grown this summer; then, from the veg patch, I picked a handful of baby courgettes (grown in a pot), a long leaf of Cavolo nero kale, a corn cob (for the kernels) and a few tomatoes. Sweet Cicely replaced chervil (which I didn't have), although I could have picked tarragon, another mildly aniseed tasting herb I grow - or parsley, growing on my balcony. All I needed from the fridge was butter, leek, celery, carrot, potato and a spoonful of crème fraiche to stir through at the end. And water; the vegetables make their own stock. It's well documented that our immune systems are lowered as we head into winter, opening the door to aches, pains, colds, coughs, flu and chills. But that's the down side. Autumn is also warm socks, hot water bottles, cozy pyjamas, books, box sets, snuggly jumpers and toast. Time to nurture and look after yourself - these are a few tactics that I find helpful in beating back the winter blues. Breathe deeply; I was taught that most people breathe in a shallow way, using only a third of their lungs. Breathing deeply is calming and cleansing and a fundamental part of yoga practice. Breathe in for 6 counts, pushing your tummy out to let the lungs expand; breathe out slowly for 12 counts, squeezing your tummy in to push out the last of the stale air. Eat seasonally; porridge is back on the menu, along with chilli, soups and casseroles. Don't forget the fresh veg and salad though. I'm also a big fan of Manuka honey - a spoonful a day, etc! Keep warm; I'm always forgetting to take a scarf and jacket with me if the sun is shining when I go out. It's so easy to get caught in a chill breeze which is why I'm feeling a bit pre-cold at the moment. Don't over exert; that one's easier said than done when there's leaves to clear and bulbs to plant but, basically, it's good to take things down a notch. This is when I try to make more time for yoga practice. Get outside: - particularly if you're prone to Seasonally Affected Disorder. Make the most of lovely autumn days to wander through parks, or local greenery. Walking is good, as are the psychological effects of being close to nature. And I find that I sleep so well after being outdoors for any period of time. Go to bed earlier; this is one that defeats me as there are never enough hours in the day and I already wake up early. But, on the rare occasion that I'm ready to sleep by 11pm, I wake up raring to go the next day. Worth thinking about. What do you do to stave off autumn and winter chills? I would never have thought of adding chervil or other herbs to a vegetable soup recipe but it really lifts the soup to another level! I loved vegetable packed soup. I bought some Manuka honey for sore eyes- din’t think of eating it. I'm intrigued - how do you use manuka honey for sore eyes? I have a lot to discover about the benefits of honey! I eat manuka honey every day, probably the same way that my dad always had a spoonful of Virol (remember that?) as it was supposed to boost immunity against colds. I loved the taste of Virol, so malty and delicious! Which Manuka Honey do you buy? For eyes you use a medicinal strength. The higher the + number the better it is for eyes. Tea tree which is the bush that manuka honey is from is used for soothing blepharitis and also killing the mites that live in eyelash follicles. I tried it along my eyelashes and eyelids but I’m not sure it had any effect. Some actually use it by diluting it and using the drops in the eye.